Microsoft security essentials is the free antivirus software from Microsoft for Windows 7. Unlike other antivirus tools which update their signatures every few hours, Microsoft security essentials is updating its antivirus signature database only once in 24 hours. But the update frequency can be changed in the Windows regestry and the following tutorial will show you how. Then click on "Signature Updates" > "Permissions" >"Advanced" and go to the "Owner" Tab. There click on the administrator group and click OK. Now your back in the "Permissions" Window, select the "Administrators" Group and enable the checkbox which is labeled with "Full Control". You have changed the permoissions now so that your administrator user can edit the keys. The next step is that you doubleclick on "SignatureUpdateInterval", select "decimal" and enter the update interval. The interval is set in hours from 1 to 24. For security reasons, you should then change the permissions back from "Administrator" group to "System" group and close the registry editor. 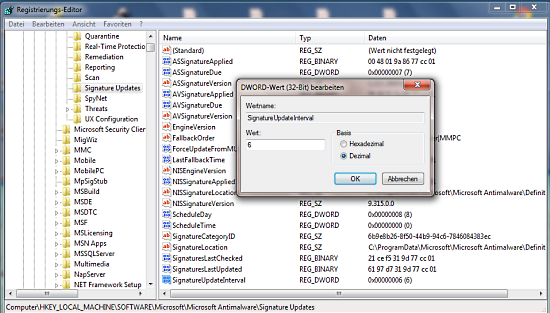 Microsoft security essentials will now update its signatures in the interval you set in the registry. cd "C:\Program Files\Microsoft Security Client\Antimalware"
The commnd should be executed as "SYSTEM" user. For security reasons, you should then change the permissions back from “Administrator” group to “System” group and close the registry editor. *HOW* do you set it back? I have no idea what the original setting was. The instructions tell you “just change it”, not write it down. > Then click on “Signature Updates” > “Permissions” >”Advanced” and go to the “Owner” Tab.